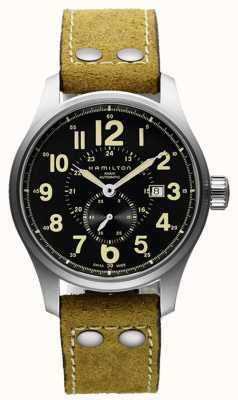 From the men's Khaki Field King range comes this true modern-classic, touching on Hamilton's history in military timepieces. 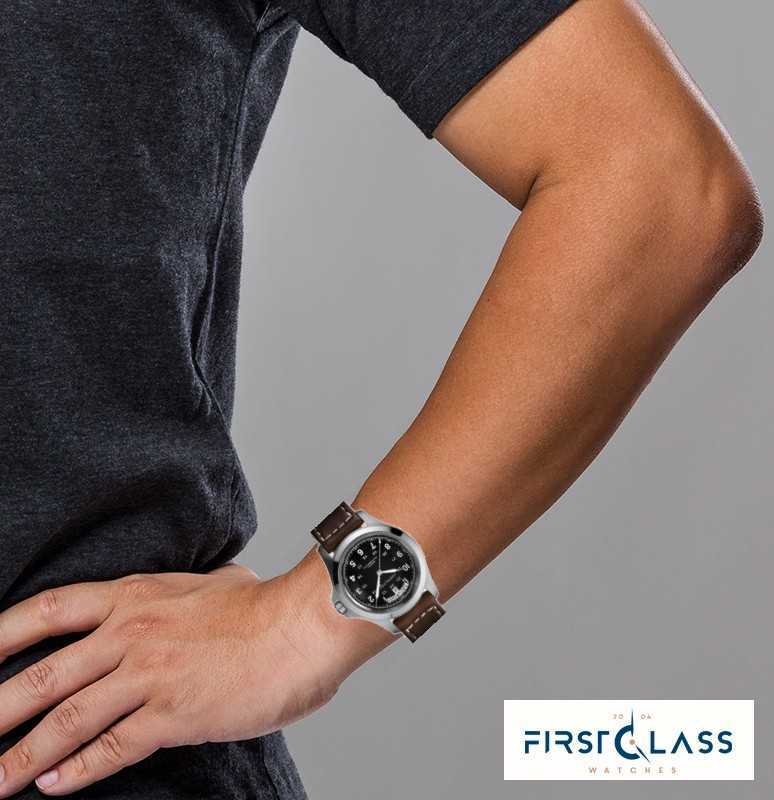 This handsome model features a black dial, stainless-steel case, and brown leather strap. 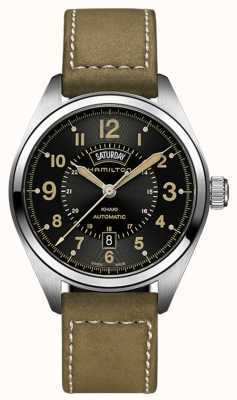 Vintage hour-markings and an exquisite full day/ date display which takes pride of place at the 12 o'clock position add even more character to go with a utilitarian feel. 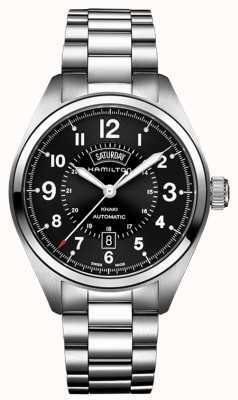 Features: day/ date display, glowing hands/ hour-markers, and Swiss automatic movement. 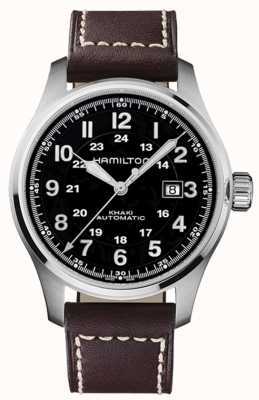 First Class Watches are Hamilton watch retail partners so you can be assured your sparkling new watch will arrive with a stamped manufacturer's warranty, packaging and instructions. 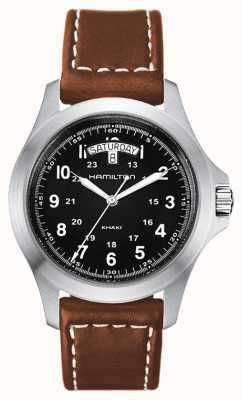 The Hamilton Khaki is a delightful watch, accurate, superbly made and a pleasure to own and wear. 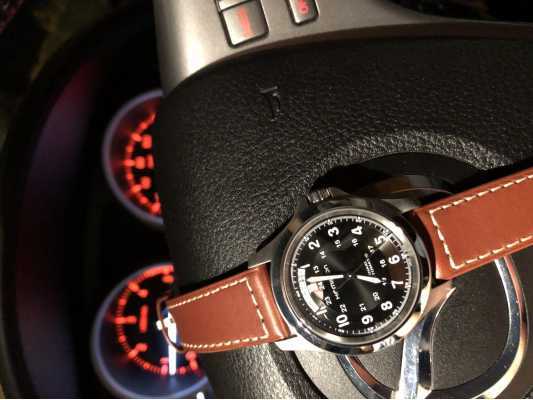 It exudes quality and precision and the leather strap enhances what is an already beautiful looking watch. It's great watch for great price, quick delivery. My watch arrived in less than 24 hours after I placed the order. 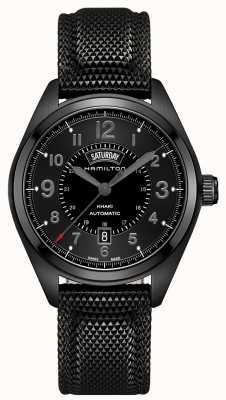 I took a punt on this watch, having never owned a Hamilton before. But I'm very pleased that the gamble paid off. This little beauty oozes quality and keeps time within +/- 1 second per day. Very happy. First class service. I was impressed with the speedy delivery especially considering I ordered over the Christmas period. The watch was well packaged and I was able to track the parcel from start to finish. I’m more than impressed with the watch. 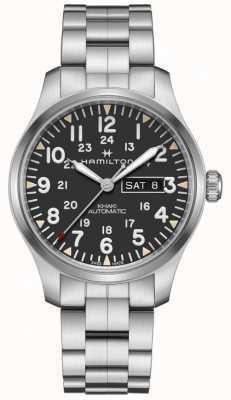 After receiving my first Hamilton over Christmas I soon had he Hamilton bug! 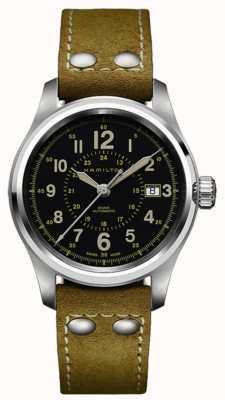 This is now my second and I’ll no doubt be using First Class Watches again to order my next watch. 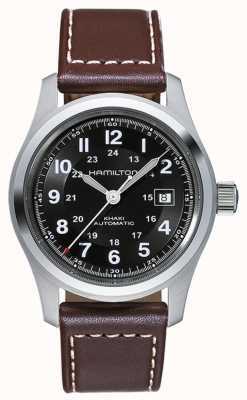 Just received my Hamilton khaki field king, first impressions great classic looking watch, exudes quality looks great on the wrist, recommended. 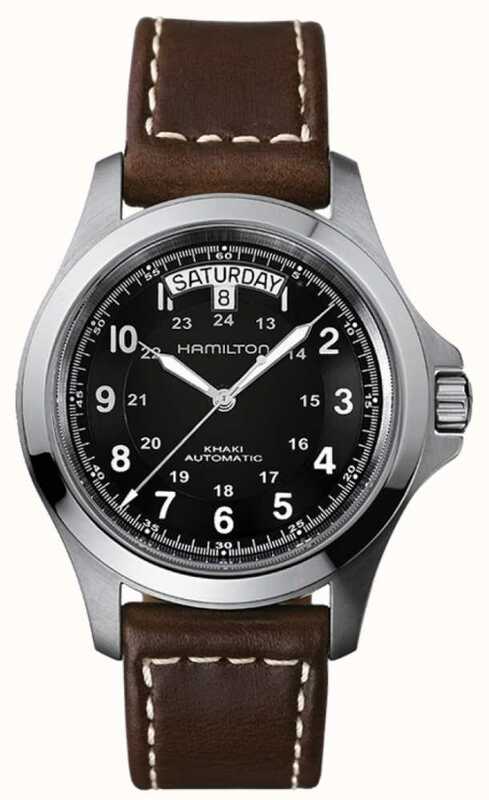 I ordered the Hamilton Khaki King day date and I am very happy with it.It is a very smart looking watch for the money and it seems to be excellent quality and it looks even better with a nato strap that I have fitted as the brown leather one it comes with is not to my liking. 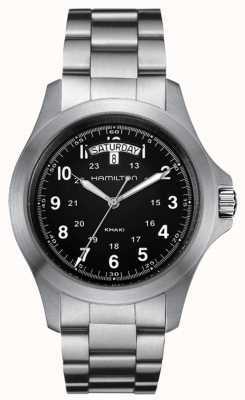 All in all a very sleek and stylish watch without paying stupid money. 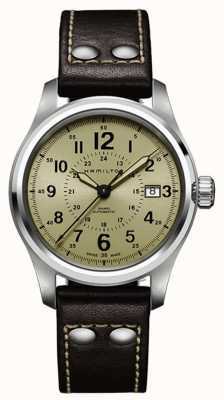 It's a great watch in a great size, it would be better if the lugs curved more to fit your wrist. The photo shows it on a padded pilot strap after purchase. The watch came with scratch marks on the inside of the lug but I don't mind it. Great watch, just what I wanted. 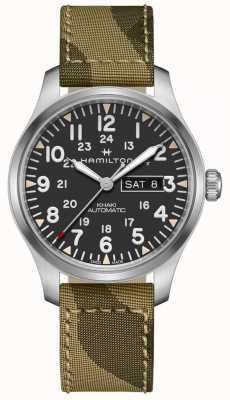 Second Hamilton I have purchased from First Class Watches in the last two months. 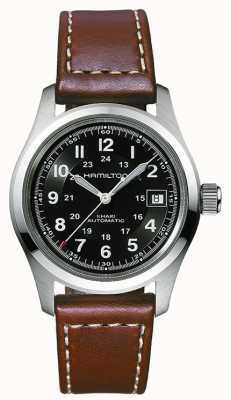 For an automatic watch with a great movement it's such good value, and absolutely fantastic service again. 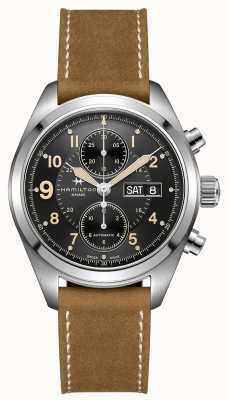 Lovely watch to look at, strap good quality too. Extremely happy with my purchase. 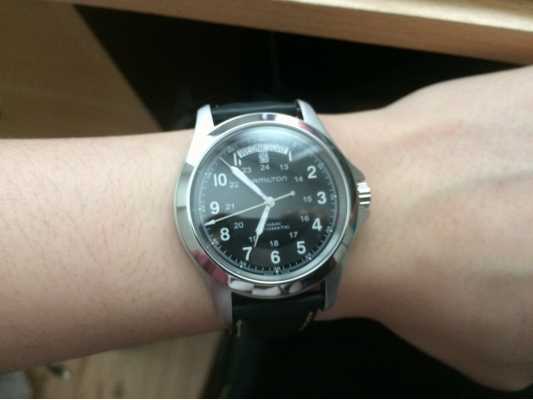 The watch is very classy and good looking and the size is perfect for my wrist. The service was excellent. Accepted my offer and dispatched almost immediately for next day delivery. Would recommend both watch and company. 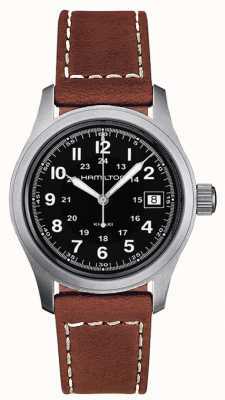 Timeless, the Hamilton Khaki King, keeps the spirit and functionality of its ancestors, field watches delivered to US soldiers in the previous century. At the same time incorporates a fine piece of swiss horology, the caliber ETA 2834/2 with day/date, robust and precise it is a classic by itself. to see the white hands against the black dial, the big white numbers also help in that matter. A classic worth to be a part of any collector.